Dandy People > Blog > Game Development > Gamification at home – every one is a winner every day! 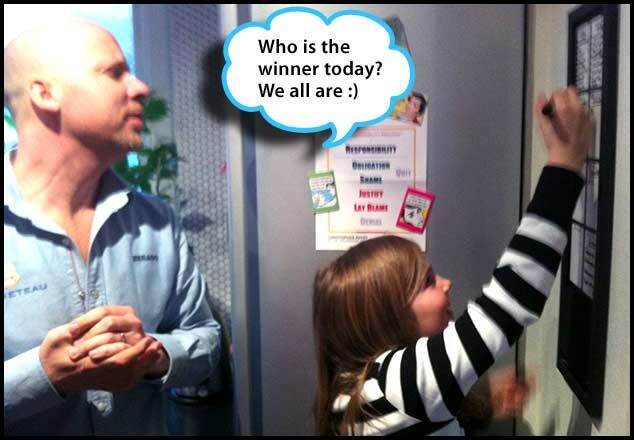 Gamification at home – every one is a winner every day! 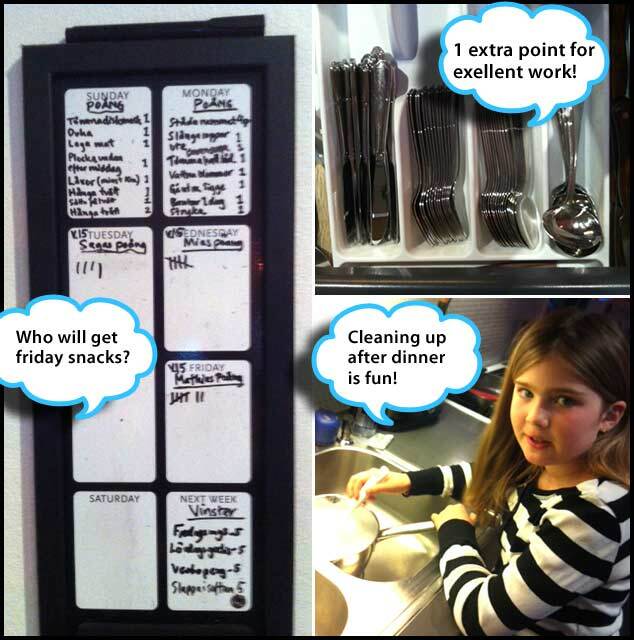 Gamification at home – the most cunning plan. Last week I started a free gamification online course on https://www.coursera.org/course/gamification. the course was really engaging and had a great setup with short 3-12 min videos. In most videos there are one question you need to answer to proceed. After watching 10 videos or so I did the exam for that first week of the course, and had a score of 100%. It was a really fun and easy way to gain new knowledge. In one of the videos the teacher Kevin Werbach gave me an assignment to list all the things I could come up with that are gamification in real life. Gamification is when there are some kind of rules, you play the game voluntarily and the game motivates you to do something or to change a behaviour and you get some kind of prize if you succeed. There could also be a use of game-like features like points, prizes, badges, assignments, leader boards, teams or avatars. I did have some problem seeing where this could apply at first… but then I saw a few examples. At work for example when they are starting competitions to motivate people to sell more, to work out more, or when they have “Employee of the month”, or in diet clubs like Weight Watchers On all these occasions we usually find points, prizes, badges, teams, leader boards… So, yes they are all gamification of course. We also learned how gamification was a powerful and fun way of changing behaviour. A game pull the player into a “circle” where the player feel joy which gives power to do things they otherwise might not do. This can of course be used for evil AND good purposes. I started thinking about where I might could test this new knowledge. First I wrote a long email to my client about everything we could do with this in their business. Maybe something will come out of that – who knows. But after that I came to think about behavioural changes I would like to see at home… and I came up with a concept where all members would collect points when helping out with things I want help with, to be able to buy things they want with the points they collect. Hopefully this would motivated them to help out more at home. I just wrote it down on two post-its to show my daughter Saga (10) when she came home. Guess if it was an instant success! She loved the idea of being able to collect points, compete with the grown ups – and being able to “buy” Friday snacks, Saturday candy and weekly allowance (all of which she was given for free before!). I am totally amazed with the engagement this created! We all sat together and created the list of what should give points. And a list of what we could buy for these points, things that we would like to have or do. Both my husband and my 10 year old are obsessed with this now competing with each other, setting up their collected points as soon as they get home 🙂 And when we where shopping groceries for Friday dinner I asked Saga what she would like for dinner, “Meatballs – because then I can make dinner and collect the points!”. I have never seen such a result in such a short time! I am have been thinking about gamifying my todo list. I think your system hits the sweet point. The tasks need to be done anyhow, so gamifying them won’t decrease motivation. You also have healthy competition built in. Thanks for sharing this. You just might inspire me. Have you seen http://www.chorewars.com/ that implements something like this? Also, I don’t have so much gamification experience myself, but just like Susan I’m also considering the motivation factor. Isn’t there a risk that she will not help out with anything unless she gets points for doing it? Or stops doing chores because she has collected enough points for snacks, candy, allowance and TV watching? that site was new to me. I did’t log in so Im not sure exactly what they offered. About our litle game, we only started last week, and she is still very exited about the game. Mentioning it several times a day (latest this morning at breakfast), saying things that se really loves it because it gets her benefits. It really seems that se think that she gets more benefits now than before – even though thats not really true. The games gives her a feeling of control, feedback, recognition and choices of what to do with her points. All of witch are important components in gamification 🙂 We named the game the “Win WIn game” yesterday, and she got the first “WinWin of the week” badge 😉 She actually collected 35 points in only 5 days while I had only 15 😉 If wyou are trying this you could offcourse add points for what ever you think are good things to do, and set the value to what you want and have what ever prizes you want. Hopefully you can find a relation between actions and winnings that works for you. We also added bonus points for exellent work – and good deeds… so its focusing on the over all behaviour. I love it Mia. Congratulations and thanks for your shining example. And it is a joy to see the Responsibility Process poster hanging in your home. Bonus! Hi you know you just saved us. We started a gamification 1 month an half and we just appreciate to have a couple life again. Hi Alexandra! Glad to hear you have tried it and that it works for you too 🙂 Hope it evolves and makes your family continue with this type of fun and interresting experiments. 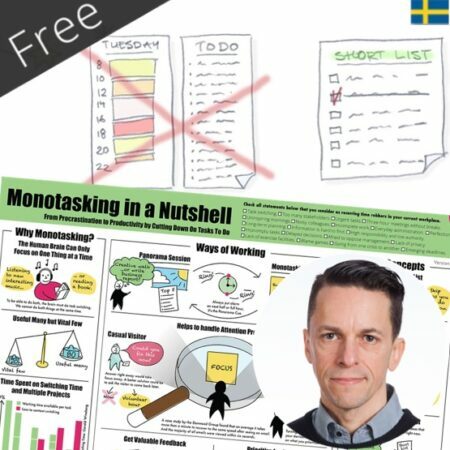 Gratis Seminarium – Monotasking – ta tillbaka makten över din arbetsdag!